One of my 2012 goals is to improve my drawing skills with a focus on perspective and figure drawing. I was surprised at how much interest there was in the sketches I posted, but since it's there, I thought I'd make proper blog posts about the process as I go. 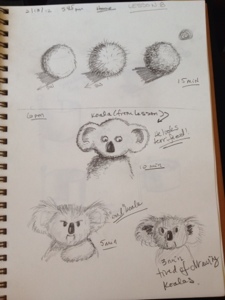 You Can Draw In 30 Days by Mark Kistler Lesson 8 - "Cute Koalas." (2/11/13).